ndroid is the worlds most popular opensource mobile platform OS developed by Google. Android Debug Bus (ADB) and Fastboot are the mediums to communicate your android phone with your PC. As the user base of this OS is increasing rapidly, the issue of Google Account Lock or FRP lock is also being increasingly faced by the users. 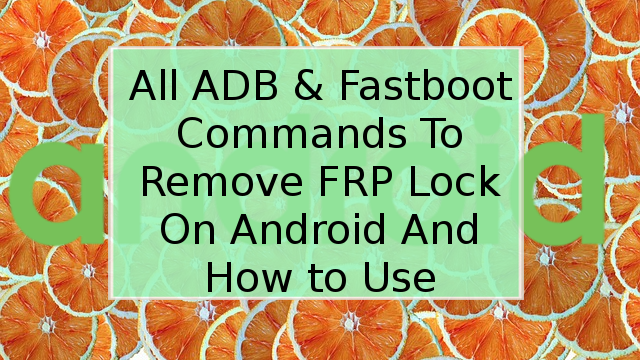 Basically this article will take you through the process to remove FRP lock on your Android device. Walk through the steps below to install ABD/Fastboot on your PC and remove google account lock from your device. For your ease, i have linked a automated installer of ADB and Fastboot. The setup will automatically configure the environmental variables for you. Just download the minimal adb and fastboot setup from the link below and install it on your windows PC. After that just to make sure everything is ok, open CMD and then type and run adb and fastboot once at a time. See if they run or you got a error. To be able to remove FRP via ADB make sure your USB debugging mode is already enabled on your device. All android device out there doesn't support Fastboot mode, so make this one too, else you wont be able to use the following commands. To remove FRP via ADB commands, Power on your device normally and connect it to your PC using USB cable. Now open CMD and type the following commands one by one (3 times). After the commands finish executing, reboot your device and FRP will be gone. To remove FRP via Fastboot commands, put your device into bootloader mode/fastboot mode and connect to your pc using USB cable. To enter fastboot mode google your model and brand as its differs from brand to brand on how to enter fastboot mode. After connecting your device issue the following commands as it suits you in the CMD. Android is the worlds most popular opensource mobile platform OS developed by Google. Android Debug Bus (ADB) and Fastboot are the mediums to communicate your android phone with your PC. As the user base of this OS is increasing rapidly, the issue of Google Account Lock or FRP lock is also being increasingly faced by the users. Finally we have came to the end of our article and hoping that our visitors will find it helpful. If you face any issues comment below.